Santa Sleigh Images and More! Here we have a cute collection of nostalgic and fun antique Santa Sleigh Images as well as other modes of transportation! The vintage images of Santa in different types of ‘sleighs’ shows transportation in many ways. This curated set of Santa images begins with four color images of Santa in a traditional sleigh, in a car, on a bicycle, and even floating in an airship. 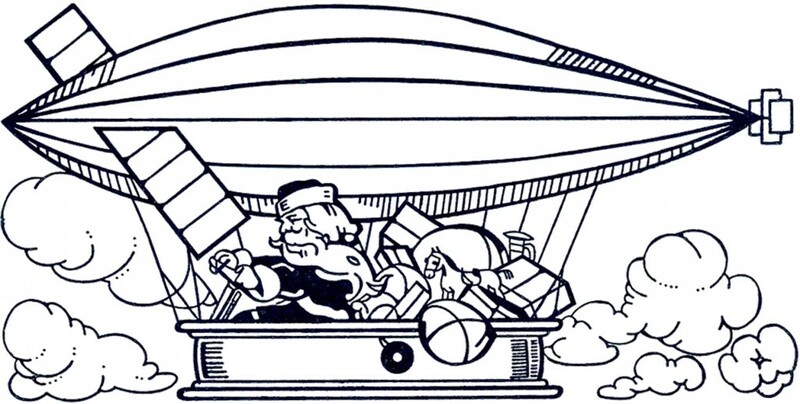 The last set of five images are black and white with several forms of transportation including a dirigible. I thought these images might be fun to use in your Handmade Holiday or Christmas craft projects. Here is our newest Santa Sleigh Ride image for this year! 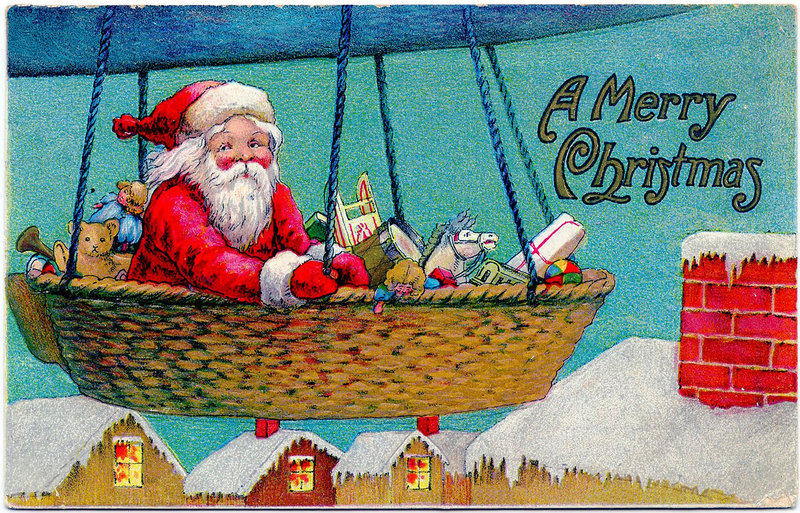 This is a gorgeous pre-1910 postcard showing our man of the hour flying across the sky in a very ornate pink Sleigh! The sleigh is being pulled by 2 strong looking Reindeer. This is a Fantastic Vintage Santa Sleigh Image!! It is a scan of a marvelous Antique Postcard that shows Santa riding in his vintage Santa Sleigh, with fur and toys, tucked all around him! I think this illustration is incredibly beautiful and I hope like it too! 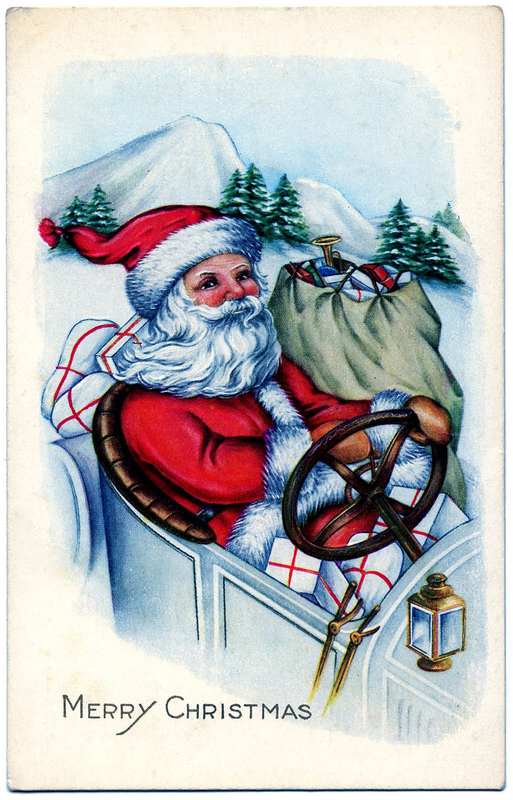 This fun Antique Postcard shows a cute Santa driving an Old Fashioned Car! It looks like his Elves gave extra care to the Red and White Presents in the car, they look so festive! Fun, fun, fun!!! This is an antique postcard showing Santa Claus riding in, what appears to be an Airship. I guess the Reindeer were taking a break! I love the bright colors on this one. 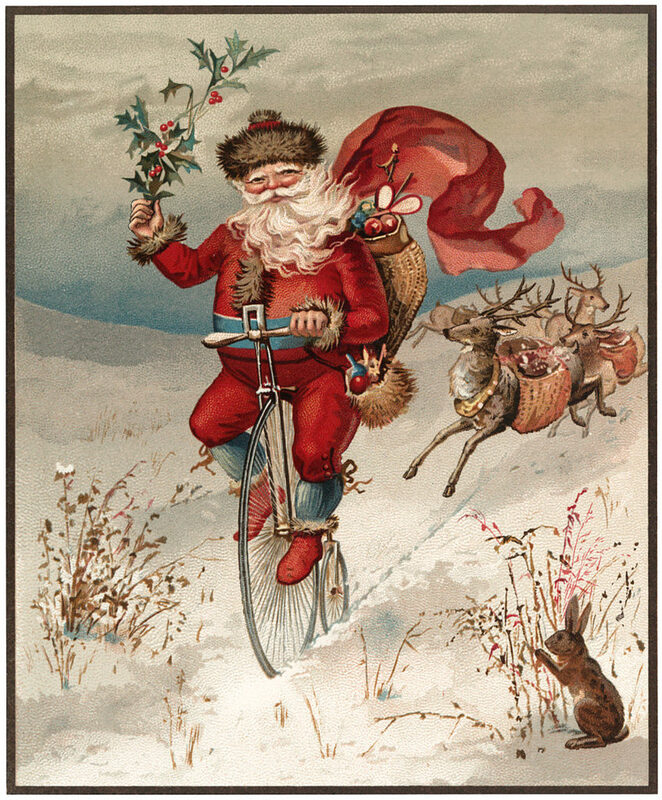 This Antique Santa on Bike Download shown above is a wonderful Antique Christmas card showing a Santa Claus riding through the Snow on a Velocipede! A charming Nostalgic Card. Below is a collection of five Santa sleigh pictures. 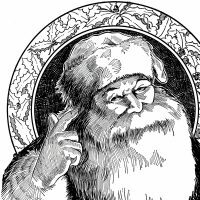 Clip art Santas are fun and humorous. I hope you enjoy these funny Santa sleigh pictures as much as I do. 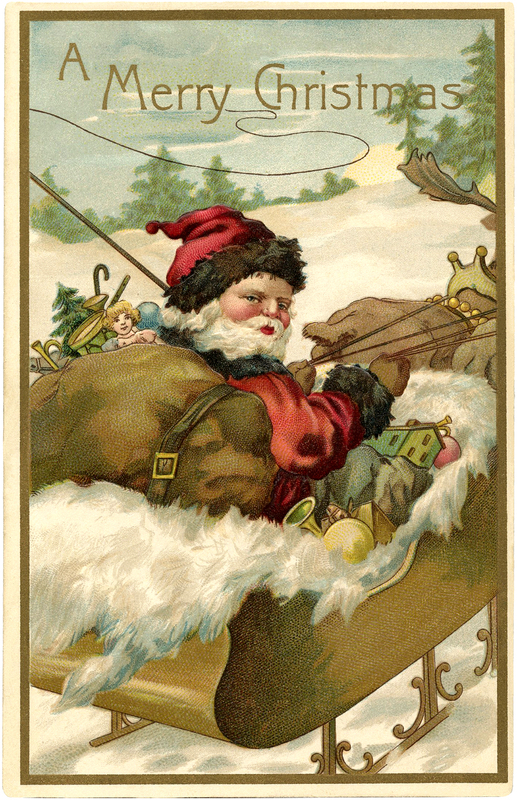 This is a fun Vintage North Pole Santa sleigh picture! This one was scanned from a Circa 1915 Printer’s Book. 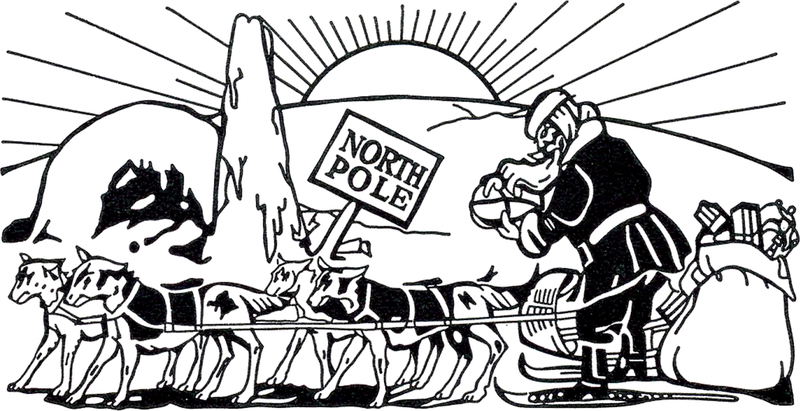 Featured here is a nice black and white illustration of Santa at the North Pole. Instead of a traditional sleigh he’s pulling his sack of toys via a Dog Sled! 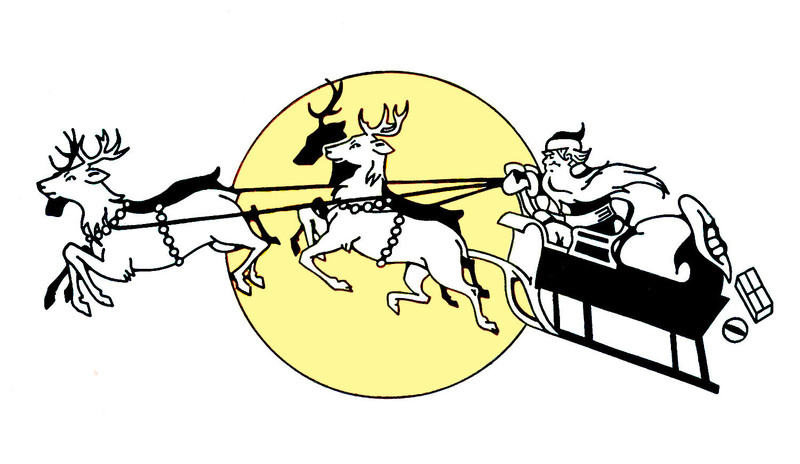 This is a fun Vintage Image of Santa with his Reindeer sailing past the Moon in his Sleigh! It looks like he’s losing a few presents along the way!! This one comes from a 1915 Type book. I think it would be fun to color this antique Santa sleigh image! 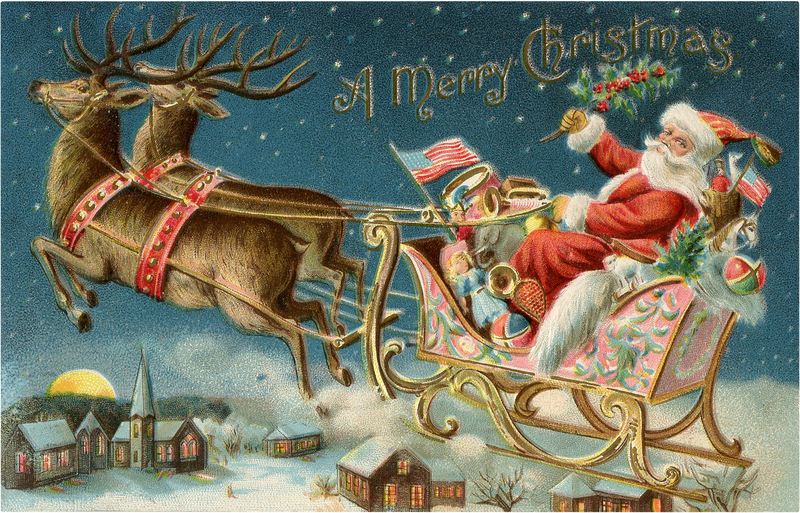 Here is a cute vintage image of Santa riding in an old fashioned automobile! The car is filled with toys that are all ready to be delivered! There’s a nice little space on the front of the car, where you could write in whatever you like. 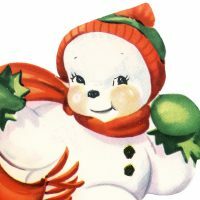 This is a Cute Vintage Santa Dirigible Image scanned from a Circa 1915 Printer’s Book. Featured here is a fun black and white illustration of Santa riding through the sky in a Dirigible! This would be a fun one to color too. 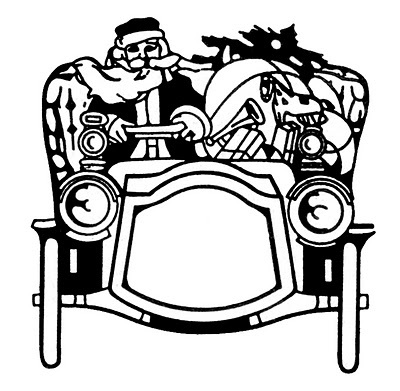 This is a cute Santa Driving Car Image scanned from a Circa 1915 Printer’s Book. 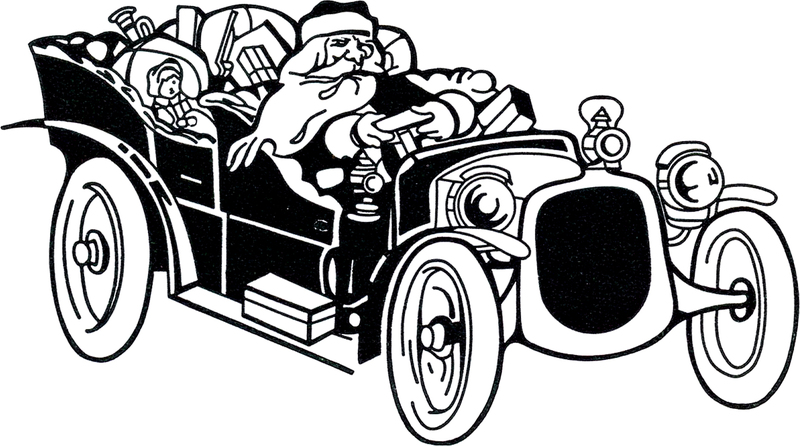 Featured here is a fun black and white drawing of Santa driving an vintage car filled with Toys and Gifts. I hope you enjoyed this curated collection of vintage Santa sleigh images. You might also like our Best Christmas Images Collection HERE. He is truly gorgeous. I can’t wait to print him out for the handmade garland I’m making. Thank you so much for sharing him and all the marvelous images to offer us every day. I love your site! I love the way the colors show up in this Santa! So many cute cards or scrapbook pages could be made with this. All of these images have great detail to them. They are gorgeous, love the old fashioned style which is far more beautiful than some of our traditional Christmas cards and images of today. Thanks so much for sharing these with us! I completely agree with you Irene, I hope you had a wonderful weekend!